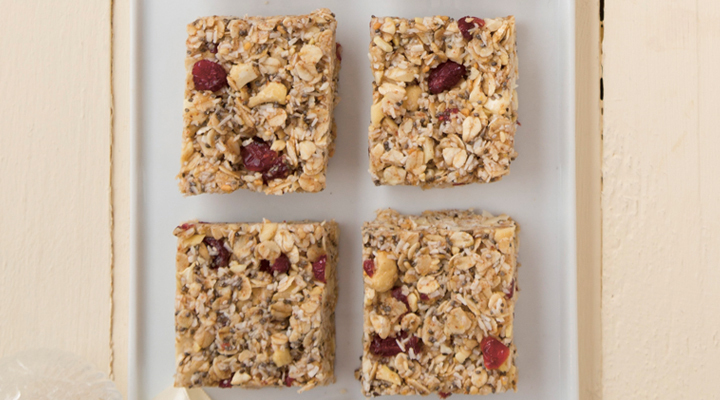 These coconut and cashew squares are an amazing treat or energy-boosting snack for a physically demanding day and a super option to balance out all the indulgence over Christmas. *This recipe makes 12 to 16 squares. 1. Line a 23cm square baking tin with non-stick baking paper. 2 Combine the cashews, oats, coconut, dried cranberries and chia seeds in a large bowl. 3. Place the honey, peanut butter, coconut oil, cinnamon, vanilla and salt in a saucepan set over a medium heat. Stir until the coconut oil has melted together with the peanut butter. Add these wet ingredients to the dry ingredients and stir well to combine and coat the mixture. 4. Transfer to the lined baking tin and pack the bars down tightly to ensure the mixture sticks together. The harder you press, the more they will stick together, so press them in very firmly. 5. Place the tin in the fridge for 2 hours, until firm. Using the paper, lift the bars out of the tin. Place on a large chopping board and cut into squares.